Today, digitally savvy companies manage a growing set of web experiences. But the willy-nilly addition of standalone sites within the enterprise - typically built on an array of technologies by disparate groups - leads to wasted efforts, unnecessary expenses, and problems sharing content and capabilities. The solution is a consistent yet flexible and extensible platform for content delivery, based on Drupal. 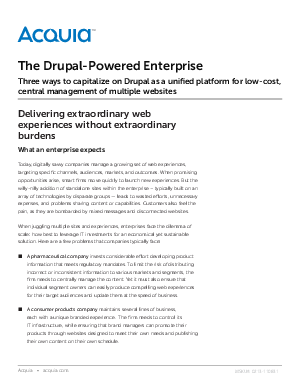 The Drupal-powered enterprise relies on a scalable content infrastructure while also reducing development and operating costs. There are three ways to capitalize on Drupal for web experience management.